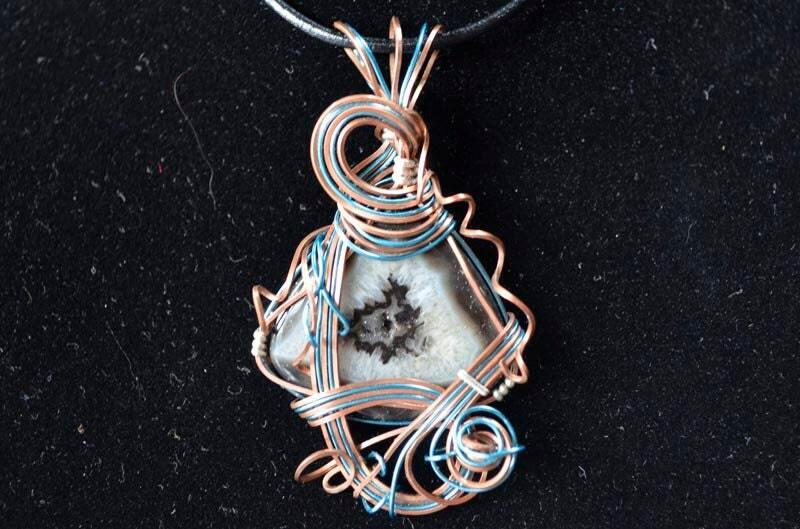 Copper and blue wire wrap pendant with Druzy Agate geode. This is a smooth stone wrapped up in a pendant. Beautiful reflections, it just barely shows all the way through, giving some beautiful striations of color and variations of the crystalline surface. Agates are individually unique. They are sliced thin in order to be worked into our jewelry and display a colorful array of reflections from the crystal within. These agates are classically formed when gas bubbles are trapped in solidifying lava and is the most common variety of chalcedony or a form of quartz. Druzy or Drusy agate geodes have pockets of crystal that open to the backside of the stone. Druse or druzy is considered a coating of fine crystals on the surface of a rock fracture, a vein or within a geode.